Should Captain America work for the government? Karen: I'm sure most of you know that Steve Rogers, the former Captain America (that sounds so wrong) is now Steve Rogers, Super-Soldier, and is essentially fulfilling the role Nick Fury once played. He's been described as "America's top cop", and his position was given to him by the president. Karen: While on one hand I am glad to have Steve back and bringing some sense of order to the Marvel Universe, this idea that he is now reporting to the U.S. government bothers me. Perhaps it's because I began reading Cap around the time Steve Englehart had his tremendous run on the title. Englehart's Cap did a lot of soul-searching, particularly during the Secret Empire storyline, and came to the conclusion that his responsibility was to the Constitution and the ideals of the country, not to any one administration or president. That made a lot of sense to me. Times change, the people in charge change, but the Constitution is forever and whatever it is that defines America lies within that document. Later writers continued to build on these ideas. Karen: We've seen a number of times in the past where Cap came into conflict with the government -most recently, in the Civil War -and he's restated again and again that he owes allegiance to the country and its ideals, but is willing to defy the government when he feels it is not in accord with the laws of the land. On the other hand, he has also scrupulously followed the law as much as possible throughout his career, and obviously respects authority. Karen: But does it make sense now for him to come back and essentially take on a job with the government? Yes, I know, in World War II he worked for the government, but he was a soldier in war time. Later, after he was revived by the Avengers, he wanted a position in SHIELD. But both of these occurred before his pivotal involvement with the Secret Empire, and the conclusions he reached afterwards. After all he has been through, wouldn't it only strengthen his belief that he needs to be outside of the government? 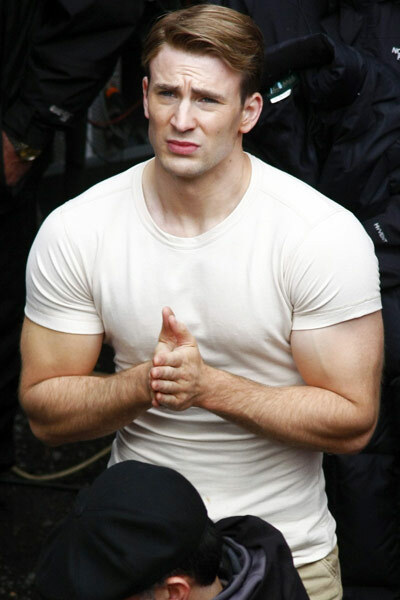 Karen: I'm sure at some point, we'll see Steve back as Cap, especially with a new movie coming out. But will that Cap be his own man? Or a government man? Here's the one that began it all -- the X-Men #1 from way back in 1963. I've always felt that the "X" was akin to the lettering in the Thor logo. I'm not sure what look Stan was going for when he approved this logo; I also always think the ends of the X look like the tops of paper sacks! The corner box showcases three of our heroes: Cyclops, Marvel Girl, and Iceman. All of these figures appear somewhat stiff. With issue #4 the Angel took a place of honor atop the logo. I always have liked the Angel; in fact I generally like the flying heroes, such as Hawkman or even Red Raven from back in the Liberty Legion days! I like the revised corner box, and the addition of the Beast, along with the Angel on the logo brings all five team members to the cover. With issue #24, the Angel was bumped from his perch atop the magazine's title and replaced by none other than the headmaster himself, Charles Xavier. Two issues later, however, Warren found a new home in the corner box -- which was becoming quite crowded! The corner box of issue #40 reflected a big change that had taken place the previous issue -- the team had "graduated" and was no longer required to wear their school uniforms. The now brightly-clad youths strutted their stuff atop the January offering. Another big change that happened shortly thereafter was the shrinking of the logo in favor of huge call-outs announcing what event or which characters were to be featured therein. I find this especially odd in light of the static Neal Adams would get around the release of the Living Monolith issues, as drafts he submitted were rejected due to the lettering of the cover logo being obscured. BIG changes took place with the 50th issue of the X-Men. 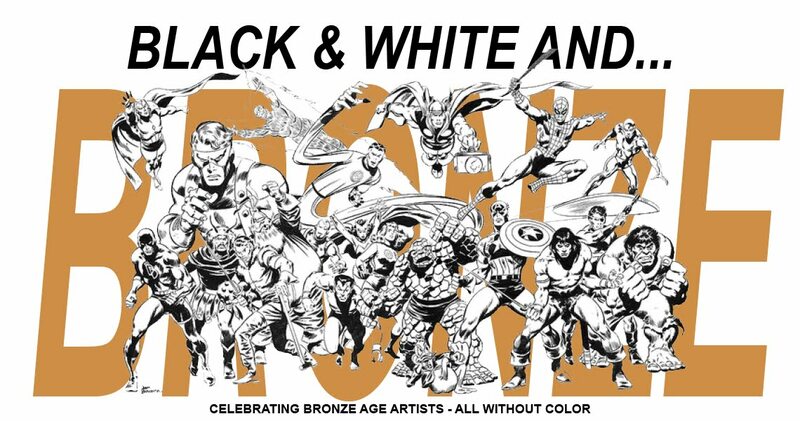 Fans will recognize the logo we've known and loved for years, as it debuted on that Steranko cover. Then, ten issues later the tag line, The Strangest Teens of All! 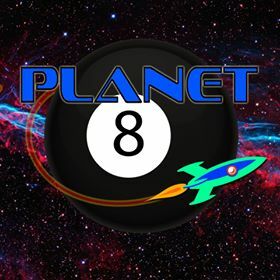 was added to the top of the logo. Doing so really hearkened back to the first two issues. And then, and then at the height of creativity the book went down the tubes with several years of reprints. The logo on the left was the primary corner box art during the reprint era; however, the image you see from issue #88 (which is actually reversed from the cover of #39) appeared then and only then. Issue #89 reverted back to the old-school Angel. I'm not sure there's a more significant midstream change in any book than the one that took place in X-Men #94. What a complete turnaround! I loved the Dave Cockrum headshots in the corner box, and they remained there for many issues -- although by #101 the circle-motif had been replaced by a more vertical arrangement. Brooding, yet ready for action -- just like the All-New, All-Different team! To close out this installment of our cover-love, we'll look at the John Byrne corner boxes. The lay-out was basically the same as Cockrum's, and it's perhaps surprising that it took Byrne two years to make the art his own. You'll notice on the cover of issue #130 that Banshee is no longer present, having lost his sonic powers. With #139 Kitty Pryde and the Angel joined the crowd, and then on #146 Kitty got some big '80's hair! EDIT: Thanks to reader The Groovy Agent for pointing out that the corner box from #146 features art by Dave Cockrum during his second run on the book. Hope you had fun with this -- Cropmaster Flash, signing off! Karen: The last decade or so has seen a ton of super-hero films released -some great, some OK, and some downright awful. But there's more than enough out there now to ask: what's your favorite super-hero film of all? Karen: I know it's a hard question to answer. I don't know that I can personally pick just one. I still have a great fondness for Superman and Superman 2. Both Iron Man films are high on my list, as well as the first two Spider-Man and first two X-Men flicks. To make this a little easier, I did say live action, so we'll get to animated films at another point -not that those will be any easier! So have your say -what are your favorites? Karen: We're back with the next part of our X-Men review. Last issue, Juggernaut and Black Tom had rather handily defeated the all new, all different X-Men (minus Cyclops). All of the team except Nightcrawler were captured. Kurt was whisked away by- wait for it - leprechauns. I don't know why, but I still find myself irritated by the leprechauns. They just seem sort of unnecessary and kitchen sink-like. Doug: Yeah, I know we commented on the little fellows last issue. And I'm like you -- trolls and elves in the pages of The Mighty Thor, all sorts of Inhumans, aliens, etc. But my first impression when I read last issue was "What the...??" Karen: Kurt meets Eamon O'Donnell, the caretaker of the castle. He explains that Juggernaut and Black Tom are holding the rest of the little people captive, and he's been unable to act against them. 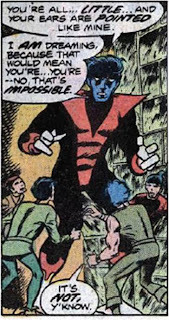 In the meantime, Black Tom has taken the other X-Men to the laboratory (do all castles have one?) and is about to torture them. Doug: Laboratories, yes -- but I did not, however, notice any spying-eyes portraits like ol' Doc Doom has! Karen: Nightcrawler gets a chance to shine here, as he uses his "image inducer" to appear as Xavier and strike out at the villains. 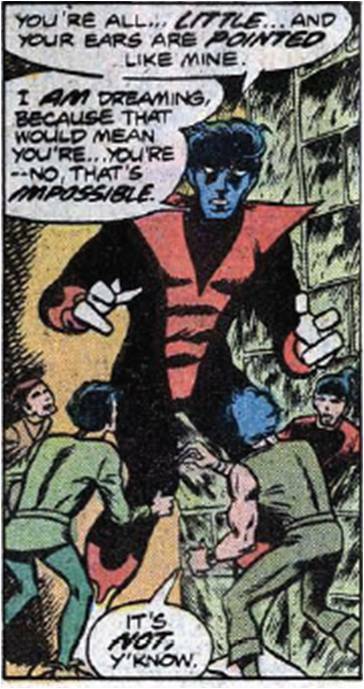 I think it's pretty well known that Nightcrawler was Cockrum's favorite X-Man -and later artist Byrne's least-liked character . I often wonder how popular Nightcrawler might have become if Cockrum had stayed on the title, and what would have become of Wolverine? Doug: It's a great "what if? ", isn't it? The Cockrum issues really showcased Nightcrawler, Storm, and Colossus. Wolverine was a player, but certainly took a backseat to the other three new heroes. I always thought the image inducer was a great tool for Kurt, and really helped to humanize him lookswise. The situation was somewhat akin to what Ben Grimm was experiencing at about the same time with his exo-skeleton. He was able to be human, yet do his thing when necessary. I wish, in both cases, those particular plotlines had been continued longer. Karen: Kurt has a good go but eventually the two bad guys figure out what's going on. 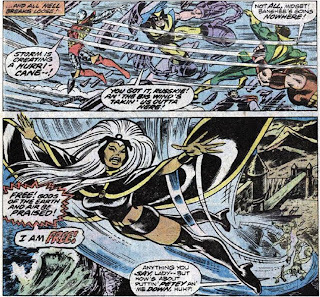 However, the fracas does create a hole in the castle walls, which brings Storm out of her claustrophobic funk. She summons a tremendous hurricane and breaks free. 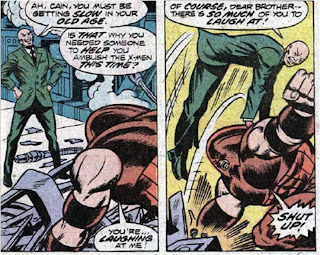 This also frees up Colossus and Wolverine, who are still bickering with each other. However, Black Tom and Juggy escape to one of the castle ramparts and take Banshee with them. Doug: Storm's powers and power levels were really being explored in these early issues, weren't they? Had Phoenix not come along, it's interesting to think about just how much more status she'd have been given. 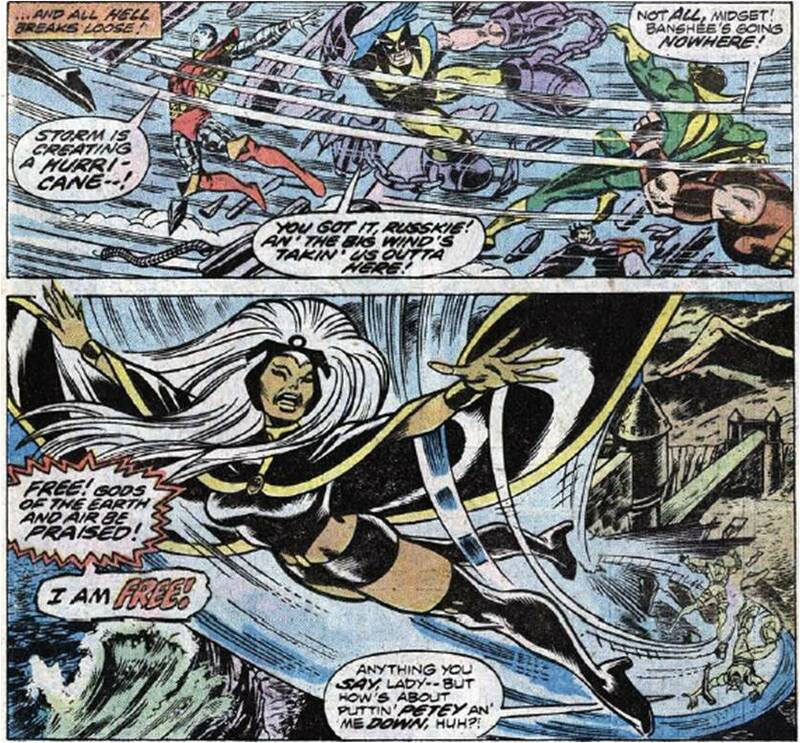 Karen: I think Storm was probably the most powerful heroine at Marvel at that time. Claremont certainly made it clear that she was a force to be reckoned with! We get a couple of nice pages of the team trying to get to the villains -I especially liked when Colossus threw Wolverine up to the top of the tower! When he lands, he runs into one of the leprechauns. There's an interesting exchange here, where the leprechaun tells Wolverine he "doesn't believe in talking Wolverines" - while it could be a joke, I wonder if Claremont and Cockrum were still thinking that our lovable psycho was actually an evolved, mutated wolverine? I've read in several different interviews that this was one of the original concepts for Wolverine's origin. Doug: Didn't you love the exchange, after Storm had dumped Wolverine and Peter on their heads, when Wolverine referred to her as a broad and Colossus threatened him to never use that term again... and then called Wolverine "shorty"?? I also thought it was a nice touch, and one Claremont and Byrne would touch on later, to show Storm's lockpicking abilities. A couple of questions, and I'm asking simply because I don't have my X-Mens in front of me: Was that the first instance of a "fastball special", and also -- was it the first time we learned that Wolverine's real name was Logan? 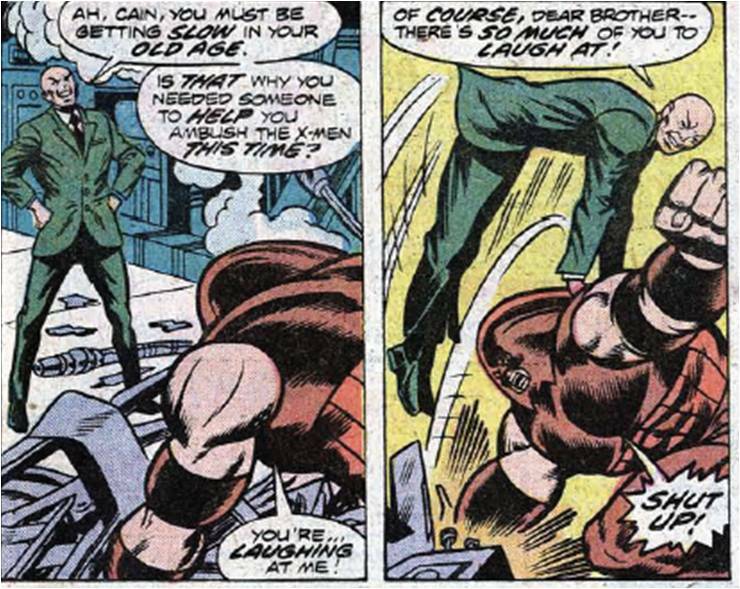 Oh, and one more thing about Wolverine's encounter with ol' Paddy the leprechaun -- just an observation about the "mutated wolverine" idea: Byrne tended to draw Logan with much hairier arms than Cockrum ever did. Karen: That might have been the first fastball special, although it was a vertical one! I'm pretty sure it was the first time the name "Logan" was used with Wolverine. I loved how Claremont just kept feeding the readers little bits of info, issue after issue. This is how you write a team book! Back to the story -Banshee is freed, Nightcrawler makes it to the top of the castle, and we have a splendid free for all going. But when Banshee knocks Tom over the castle wall and into the sea far below, Juggernaut freaks out and jumps over the castle wall to try to save his friend. As the raging sea swallows them both, it appears that things will get back to normal -whatever that is for the X-Men! However, the last panel shows that all of these events are being watched by a mystery figure, one who promises to bring the X-Men's "oldest, deadliest foe" back into the picture. Can you say...Magneto?! Doug: Happy weekend, everyone! Today I thought I'd just post a list of some of the resources I use for the work Karen and I do around here. In the comments section, feel free to add "good stuff" that you use or would recommend. 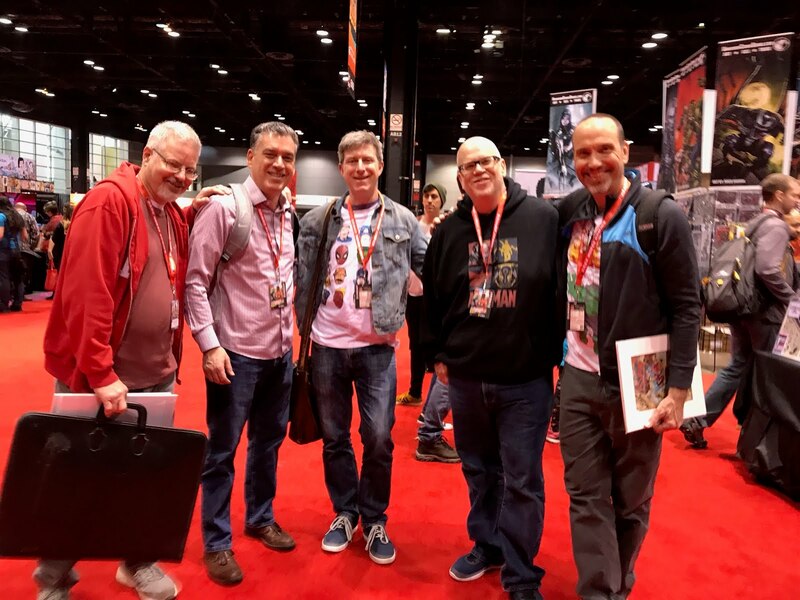 What I won't list here are the many fantastic blogs that are out there -- these will mainly be database-type sites for comics knowledge and/or images. This is a nice site -- by no means comprehensive. But the images are generally good. 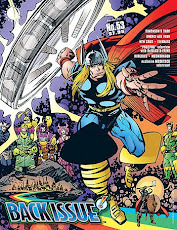 I use the Comic Book Database most often when posting covers and for creator information. It's also handy to use when wondering if and where certain stories are reprinted. The creator biographies are nice, and I really love the chronological listing of character appearances or creator works. I've also used the site for the covers/corner boxes posts when looking for what was published in a given month/year. Cover Browser is a great site -- this is one I use most often just recreationally, as they display up to 50 covers on a page. This site is pretty comprehensive, although I suppose they are lacking a series here and there. There isn't a lot of additional information -- even cover art credits are pretty rare. Another small drawback is that some of their scans are of CGC-graded books -- that really clouds the cover image and is a distraction. 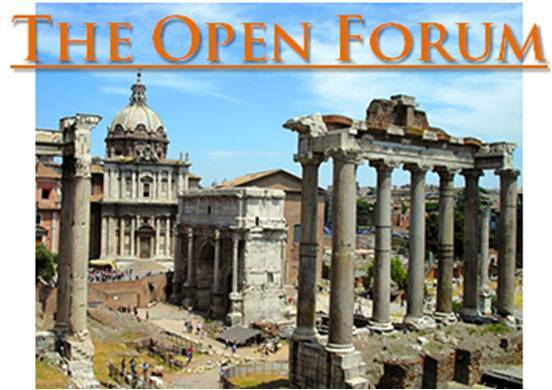 But overall, I'd highly recommend a tour of this site! I'll admit to not having used the DC Comics Database, nor the Marvel Comics Database very much, but from what I have seen, both look useful. Maybe the granddaddy of them all, the Grand Comics Database. While I prefer the format of the Comic Book Database, I do use the GCD for cross-referencing. There have been times when I've questioned a creator credit on the CBDB and felt better about the information I found on the GCD. It's for the most part user-friendly, but in my opinion not as much as is the CBDB. Additionally, the CBDB allows linking from their images, while the GCD does not. I really like the Marvel Masterworks Resource Page. It's wonderful in that it tells consumers where to not only find high end reprints, but also contains listings of Essentials and trade paperbacks. There is some commentary, and numerous links. Perhaps the best part of the site is its inclusion of similar material (Archives, Showcase Presents) from the Distinguished Competition. Lastly, I'd like to express my love for Treasury Comics! If this site isn't a love-in for a big slice of your childhood, then you didn't grow up in the Bronze Age! One of the best features are the front and back cover reproductions. Karen: Another picture from the Captain America film. Here we have Chris Evans as Steve Rogers -and hey, he looks pretty good! Obviously, they've had him on a work-out program, and you can see the results. I have a little more hope for how Evans will look in the red, white and blue after seeing this photo. Karen: What do you enjoy reading about more: street-level stories or cosmic-level epics? Karen: The street-level stories are typically more grounded in reality, with both heroes and villains either without super-powers, or with limited powers. There's usually a more personal stake or aspect to such stories. Karen: Cosmic epics on the other hand, often span vast distances and locations, and feature characters with god-like power. While they provide great spectacle, the personal side of things may sometimes be lacking. Karen: So which do you prefer? Doug: Hey, saw this over at Marvelous News and thought it was funny. If you're a fan of Marvel Legends, Twisted Toyfare Theater, or just going to the New York Comicon next month, you'll enjoy this! It's funny to look at the "plainness" of these early covers, but hey -- give Stan a break. After all, this was the book that ushered in the Marvel Age of Comics. So, it took awhile to get up to speed. I want you to notice the subtle change in the title from FF #1 to issue #2 -- see the movement of the word "The"? It would revert back to its original position and stay there until issue #17, when it would be gone altogether. Also, note that the cover to #4 (which also brought back the Sub-Mariner) was the first to boast Stan's bravado concerning his and Jack's new creation. Please also notice the corner box on issue #17; this artwork first appeared in the now-famous top left corner two issues earlier. This FF logo would remain largely unchanged for almost the first 100 issues. And, the corner box art would remain static as well for the better part of the first five years. This is somewhat significant, as in our earlier discussion the Avengers corner boxes had changed virtually issue-to-issue. However, with FF #64, we began to see a little variety, as Jack Kirby designed boxes that spotlighted each team member individually, and these alternated on the covers for the next several years. 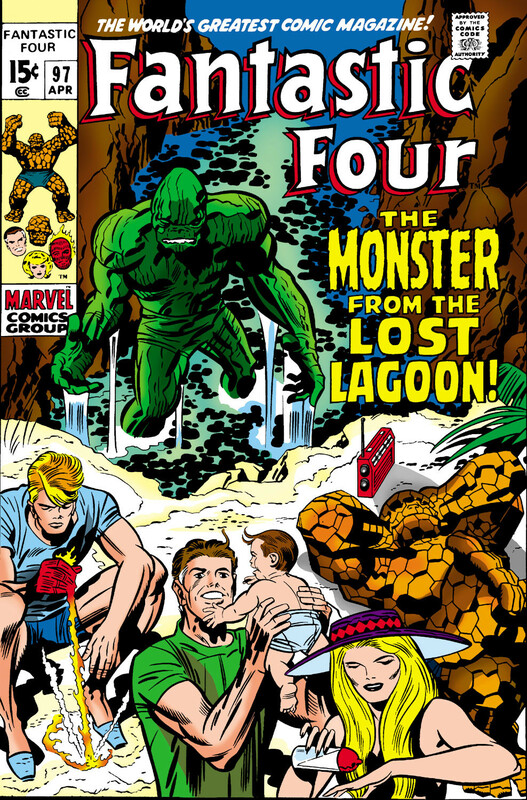 With Fantastic Four #95, there was a barely-noticeable change to the cover logo -- take heed if you will, comparing with the covers above, how the lettering loses some of its height. Not a big deal, and most people probably never paid any attention to it. But hey -- that's why I'm here. And then... and then the changes seemed to start coming rapid-fire as we entered the High Bronze Age. First we got a new corner box, as Bashful Benjy seemed to run right off the page after us. 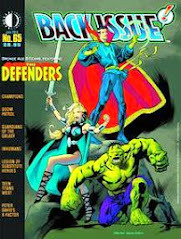 Next came a short-lived revision of the logo, followed by Johnny in the corner (the Marvel Team-Ups he headlined would feature this image on the covers, too), and then finally a thorough revamping of the covers. The four headshots on the last cover are by Rich Buckler and Joe Sinnott. The logo that debuted on issue #160 was "my" FF logo, as it appeared on the first issue I bought with my own quarter at a drug store in Milwaukee, Wisconsin. The next change was the switching of Ben's headshot from the Buckler/Sinnott image to one drawn by George Perez and Sinnott; but you know what -- on second thought, it may be by Buckler as well. Thoughts? For whatever reason, the other three team members remained the same until issue #190 , when a total Perez revamp showed up and lasted for the next couple of years. For you nostalgia buffs, this is the original logo, but shortly after this the title would revert to the style present on issue #95. You'll notice that the art is the same, although now the Four are bunched into a corner box again. It's somewhat fitting that the cover logo reverted to this style, as John Byrne would soon reinvigorate the magazine with epic tales in the style of the Lee/Kirby heyday. We'd also see Byrne use the corner box to spotlight each member, or even to fit into the cover or greater story. Note that one of the boxes is sans Sue, and the men are not so much logos but floating heads! Hope you enjoyed this look back -- anyone up for some X-Men? What's the Best Team Book EVER? 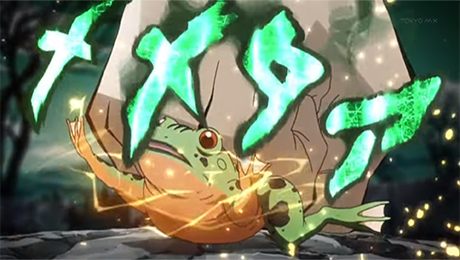 Who is the Best Supporting Character? What's More Important -- the Man or the Mask?